Death Marck. This is one of the last figures of the original line. It uses components from many other figures, including A32X. It has a suit of armor that attaches to the limbs. Allegedly derived from a manga character, but this is not verified. Cardboard cutouts of Death Marck were included as targets in the I Micronauti Blizzard set. 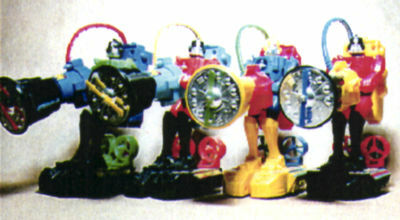 This is one of the coolest figure sets ever made - the Power Up Set. It features members of the M10X Series, but comes with some very cool little weapons and accessories. 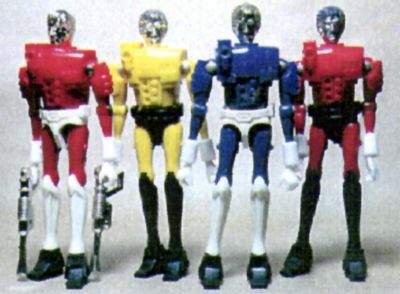 Some of the weapons had previously been issued with other figures, some were created just for this set. The two figures that it comes with have capes! 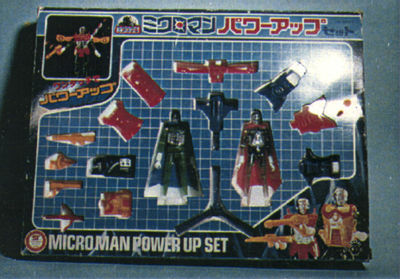 it cost Y1800 when it was released in 1980, at the tail end of the first Microman line. This is the last figure from the Rescue group. They feature the billy club like gun and were released to market at the same time as the M27X series. M281 and 282 were sold individually, but M283 came with Gyro and 284 came with the Rescue Machine set only. Corresponds to Blizzard in the I Micronauti line. Blizzard represents a drastic departure from both the simple, two color figures of the preceding years and the standard 3.5" size. 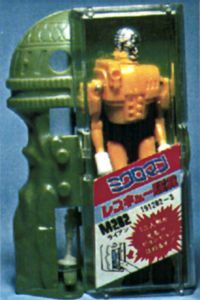 Blizzard is without a doubt the most feature-rich Microman figure. He is battery operated and has a working fan mounted in his chest. He also has a huge propeller gun which works and shoots frisbees. He can stand on a platform which functions like a hovercraft, allowing him to move about a room. 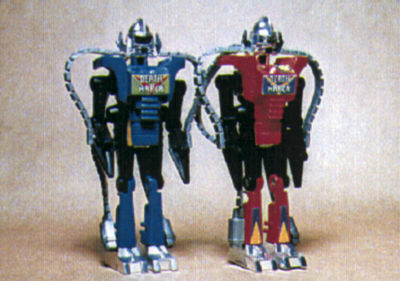 This was the configuration for the B1 and B2 set. The B3 and B4 sets had all this plus a large Blizzard vehicle. In case you're wondering, Blizzard is a good guy. 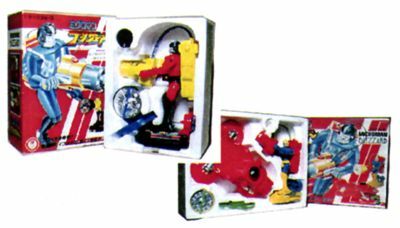 The Microman Punch, or Punch Robo, is another example of Takara's desire to make its Microman figures more ornate than they had been in previous years. 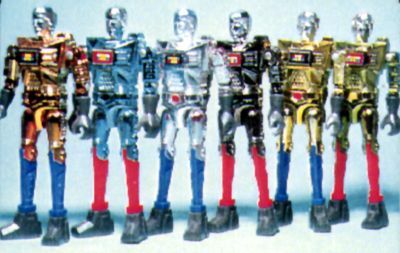 The Punch Robos have an arm which is springloaded and which punches opponents when drawn back and released. The even numbered figures render uppercuts while the odd numbered figures karate chop their opponent. The figures came with masks and chest plates from which hoses run to a backpack.